New information on a heart problem that is present in many of the adult patients with myotonic dystrophy – atrial flutter. 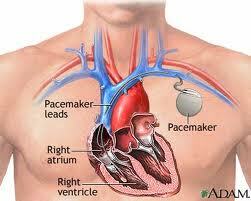 This is the heart beating too fast in the upper chambers of the heart. This new information from France gives an over view and possible treatments for this symptom. Sorry the whole article is not available for free! Atrial flutter in myotonic dystrophy type 1: Patient characteristics and clinical outcome. What is the cost of Congenital Myotonic Dystrophy tops $10 Billion Dollars in USA? When my son was born I had no idea that he would be an Over 5 Million Dollar Man.But he was born as a premmie and our medical bills started even before Day 1. The major cost of the disease concentrations on respiratory symptoms. For young people with this disease a strong effort is made to stabilize and improve respiratory function. The recovery period for individuals with this disease is very lengthy. Currently we are at US$5.2 Million in Hospital and Medical Care for him. The insurance has picked up all the costs incurred, but still its a high price. In the USA the incident of congenital myotonic dystrophy is 1/100,000. That computes to about 3,500 individuals with the disease. At a five million dollar overall cost the math computes to an overall projected cost could top 18.2 billion. If the 5 million is a outlier the cost would still be in the neighborhood of $10 billion overall cost. That’s a very high cost to society. Myotonic dystrophy (dystrophia myotonica, DM) is the most frequently inherited neuromuscular disease of adult life. DM is a multisystem disease with major cardiac involvement. Core features of myotonic dystrophy are myotonia, muscle weakness, cataract, and cardiac conduction abnormalities. Classical DM (first described by Steinert and called Steinert’s disease or DM1) has been identified as an autosomal dominant disorder associated with the presence of an abnormal expansion of a CTG trinucleotide repeat on chromosome 19q13.3 (the DM 1 locus). A similar but less common disorder was later described as proximal myotonic myopathy, caused by alterations on a different gene on chromosome 3q21 (the DM2 locus). This article will mainly focus on DM1. It will provide an insight into the epidemiology and genetic alterations of the disease and provide up-to-date information on postmortem and clinical findings and on diagnostic and therapeutic options in patients presenting cardiac involvement. The incidence of DM1 is estimated to be 1 in 8000 births and its worldwide prevalence ranges from 2.1 to 14.3/100 000 inhabitants.1 Based on the age of onset and on its clinical features, DM1 can be divided into three forms: congenital, classical, and minimal, which may occur in the same kindred. An invasive strategy, based on prophylactic permanent pacing, is associated with longer survival for patients with myotonic dystrophy type 1. Karim Wahbi, MD, of Pitié-Saltpêtière Hospital in Paris, and colleagues conducted a retrospective study of 914 consecutive patients (>18 years) with genetically confirmed myotonic dystrophy type 1 who were admitted to the hospital from 2000–2009. Of the 486 patients whose electrocardiogram showed a PR interval >200 ms or a QRS duration >100ms, or both, 70.2% underwent an invasive treatment strategy based on systematic electrophysiological studies and prophylactic permanent pacing and 29.8% underwent a noninvasive strategy. During a median of 7.4 years of follow-up, the researchers found that 50 patients in the invasive strategy group and 30 in the noninvasive strategy group died (hazard ratio [HR], 0.74; P=0.19), corresponding to an overall nine-year survival of 74.4%. Adjusting for between-group differences in baseline characteristics, the invasive strategy was associated with significantly longer survival, with adjusted HRs ranging from 0.47–0.61. The survival difference was mainly due to a reduced incidence of sudden death, which occurred in 10 patients in the invasive strategy group vs. 16 patients in the noninvasive strategy group (HRs ranging from 0.24–0.28). “Among patients with myotonic dystrophy type 1, an invasive strategy was associated with a higher rate of nine-year survival than a noninvasive strategy,” the authors write. One author disclosed financial ties to the medical device industry; one author disclosed financial ties to Genzyme. they have Myotonic Dystrophy. In many cases the physician may not be familiar with DM so the patient should be prepared to present materials to the physician. 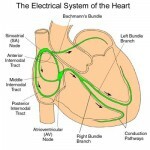 Conduction disturbance can lead to abnormal heart rhythms called arrhythmias. 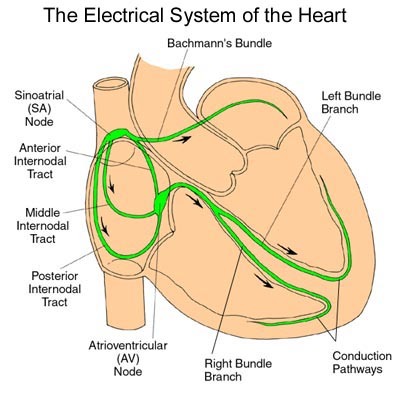 Arrhythmias that are too slow sometimes require a pacemaker that delivers regularly timed electrical impulses to bring the heart rate up to normal. The most serious arrhythmias are those that cause the lower chambers of the heart — the ventricles — to stop beating or to beat too slowly to sustain life; or to beat in a fast, uncoordinated and ineffective way. Both these fast and slow ventricular arrhythmias can lead to sudden death, and people with MMD1 unfortunately are at increased risk for that. 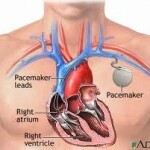 Pacemakers and Defibrillators: Pacemakers are generally used to manage a heartbeat that is too slow or irregular, caused by disorders that disrupt the heart’s normal electrical conduction system. This condition known as bradicardia can cause inadequate blood flow through the body creating symptoms such as fatigue, dizziness, and fainting. *This information was copied from the evidence based clinical guidelines developed by the Collaborative Project Byall Scottish Clinical Genetics Services.